This app is super slow. It needs a lot of improvement. I like this app and would like to upgrade to premium. How do I do that? I can’t seem to find where to make in app purchases. Thanks! 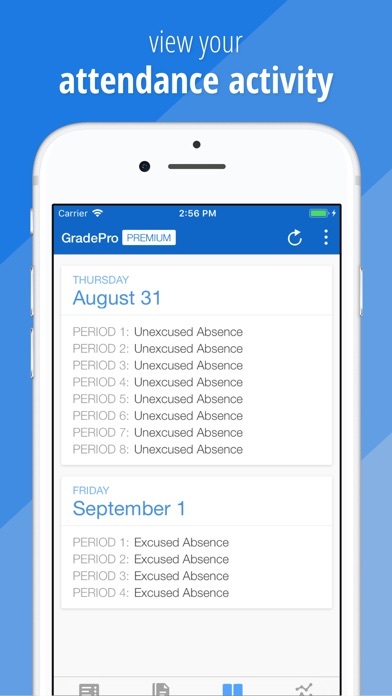 gradepro is terrible. there are too many ads that constantly pop up and you have to pay to remove them. takes a very long time to load. doesn’t even work on most school wifi. don’t waste your time. How do I make an account?! 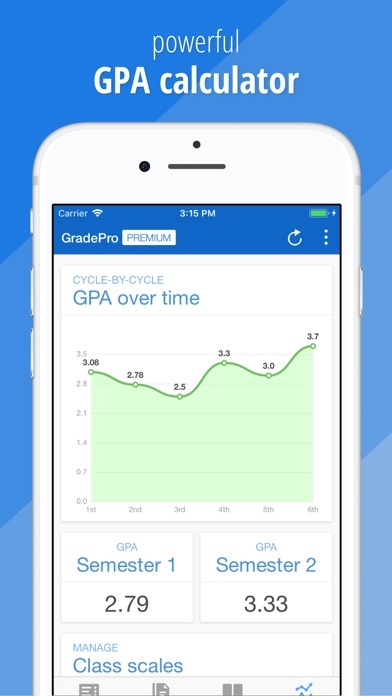 I payed for premium because I decided to invest in more info about my grades, but now the app doesn’t even show me when my grades go up or down. It used to show a small green number above the grade when it went up and a small red one for down. Even people without premium get that feature and for some reason I don’t. This is very annoying because I either have to memorize all the grades or screenshot and compare it to my current grades. That’s probably my favorite part of the app along with the GPA tab, hope this gets fixed soon. The app is great. So great that I bought the yearly premium subscription. And then it stopped working. I tried every possible way to contact their customer support. I messaged them on Facebook, Twitter, and even emailed their parent company to see if they knew how to get in contact with Sleeker App Studios. No response. Nothing at all. The app randomly decided to start working again today, not after the first time I reinstalled it, but the second time. That’s what the two stars are for. 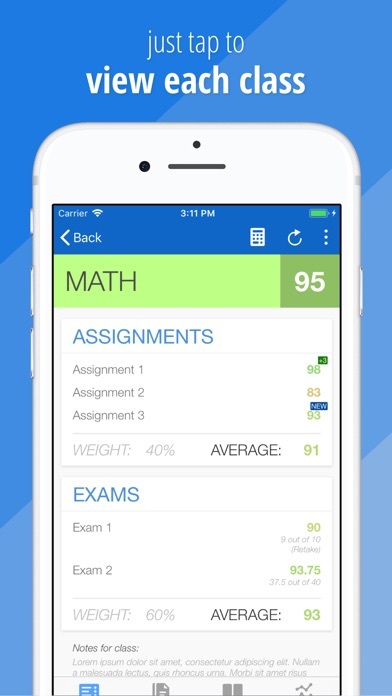 I really like this app , it helps me keep up with my grades , make sure I maintain them. I also can see any assignments I need to do or turn it . BUT, it won’t it let me log back in please help . Perfect way to track your child’s academic record. 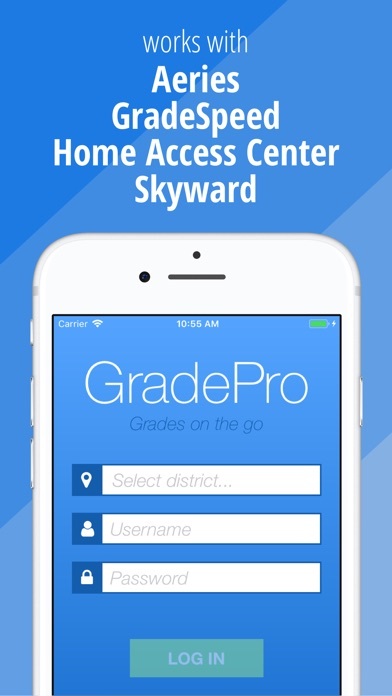 The app is nice overall, however, I haven’t been able to use it ever since Pasadena ISD switched from parent connect to skyward. I wrote a review a while back pertaining to this issue, but the responder claimed that it was up to date. It is not. No one from Pasadena ISD can login to their account. It keeps saying that Grade PRO is not compatible with the software we use. This is a bummer, especially for those that paid for the premium. Love the app, the layout is great! Makes it so easy to check grades. It is advertised as an app for 4+ age group. There is an ad that is not appropriate for a game - choices. Please remove that ad!! Overall the app was pretty good and it helped me keep track instead of logging into the website and now I got a new phone and tried logging in and it keeps on saying “ error you have to try logging into your district account into a computer first” and so I did but still the same thing and it’s kinda getting annoying now. 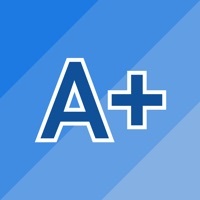 Please bring back the real Graded app. This app is awful and doesn’t even work correctly. Everyone wants it back so why not do it? So not gonna lie, this app is one of the best out there. I purchased the original GradePro whenever it was available separately for different services until it was integrated all into one, which made me mad. I had purchased the Premium (MEANING FULL VERSION) of the GradePro for HAC, but ever since it was all merged, I lost my premium and i’m pretty ticked off. That is money lost to me and I can use other apps that are cheaper subscription. So at least please let me have premium because I just don’t think that’s fair. You do have my respect on a great app though! I’ve had this app forever and I’ve bought premium, but for some reason I’ve never gotten a notification. I keep the app open even in background but I still have never gotten any, does anyone know a fix to this problem ? This app does not have all school districts, it didnt have mine. I love the app but these past 3 days I have not been able to log in at all. The app worked really well for me until my district made changes to their website and now when I try to long in it won’t let me, it says that I need to try to sign in on my district computer. Pasadena is me has finished switching to skyward but for some reason this app hasn't fixed it. App is nice and simple to use. All the extra info and setting make the upgrade well worth the $5/year if only it was easier to use between kids. Switching students is a real pain. I have four kids in four schools. Can you streamline the process? I’d send an email but support is only via Facebook (no thank you). i truly love this app n i pay for it but my only problem with it is i don’t receive any notifications from the app. The notifications are on but i get nothing. 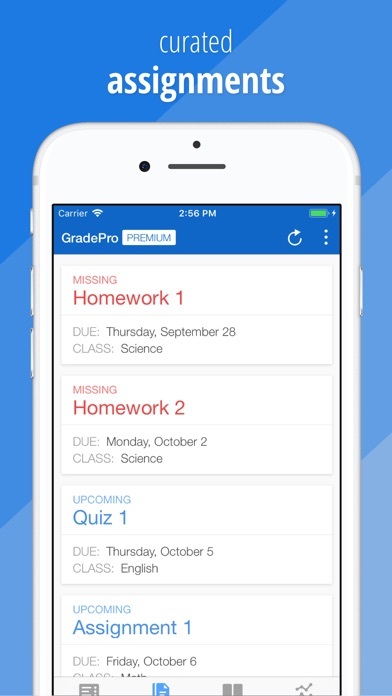 When i close the app i get a notification sayin “Gradepro cannot send notifications when closed. Tap to reopen. View notification to see why” when i do it only takes me to the app n not why. I just want to know how i can receive notifications from this app! Please send a response. Literally takes forever to load! So annoying!!! 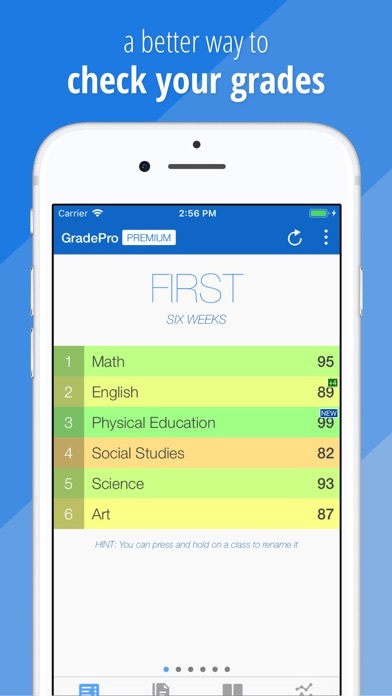 When I first got GradePro it was awesome. Now it won’t take my password and I can’t get on!! In the past I have enjoyed using this app. I liked being able to see upcoming assignments or texts and having instant access to my children’s progress. But starting this past September I would get notifications for the same four grades every time I connected to WiFi. This continued the entire quarter. More recently, I have been logged out of my account on every device (phone and desktop) and I am unable to reset my password. Hoping for a response and resolution. I have recommended this app to a lot of parents.